WELCOME TO AUSKICK SEASON 2019. Welcome to all participating children and parents to St.Mary’s Sporting Club Auskick 2019. Our first session will be Friday April 26th 2019 and registration is now open. The first step is to register online and this is done via NAB Auskick Link. You select St Mary’s as your centre or you can register directly with our centre here. Upon registration each child will receive a kit that is depicted within the registration brochure. This kit will be sent to your nominated address. 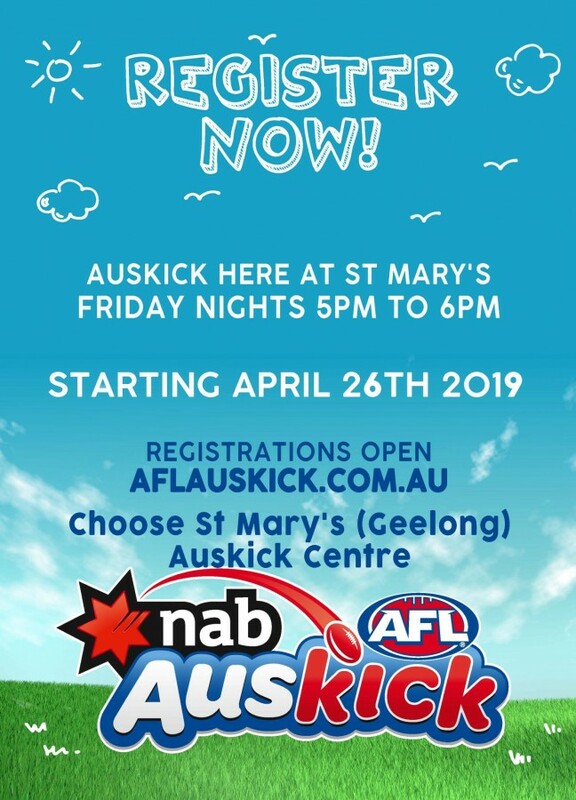 Our regular skills clinics will run from 5.00 pm sharp to 6.00 pm Friday evenings at the St Mary’s Sporting Club, Kardinia Park West, La Trobe Tce Geelong, In the event of a Geelong AFL home game being played on a Friday night, St Mary’s Auskick will be held on an alternative night of that week. (listed as Thursday 4.00 pm – 5.00 pm). We will soon be announcing our full Season Schedule.